Farmers various media outlets spoke to have either described the government’s flagship income support scheme as “a good start” at best or “useless” at worst. 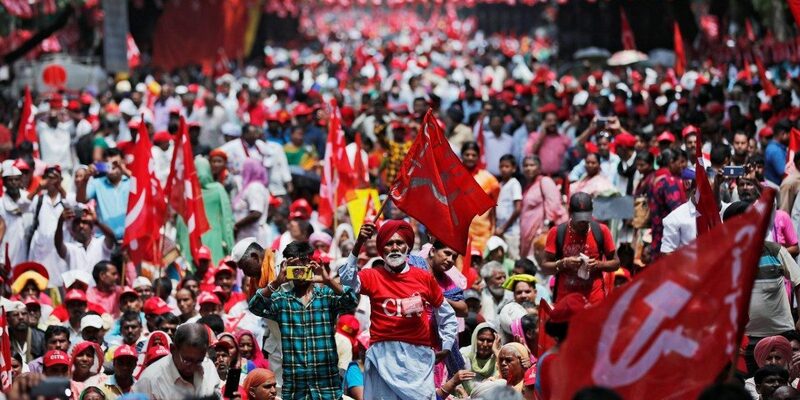 These moves come after hundreds of thousands of farmers marched to Delhi in a landmark event. The fact that the government isn’t able to respond appropriately even after such a clear demand by farmers has been made shows that they are clearly incapable of adequately handling the agricultural crisis. As discussed in an earlier edition, the suicide of a taxi driver in Chennai has instigated a series of agitations in the city as various people’s organisations have taken up the cause. This cynical move by the police to eliminate Rajesh’s last words shows how corrupt an institution like the police can be. The All Nagaland Domestic Workers’ Union has been recognised and registered as a trade union by the state’s directorate of labour after extensive campaigning. Its 1,750 members are demanding that they immediately be included “as ‘workers’ in the scheduled employment list of the Nagaland Minimum Wage 2012”, which will give them greater negotiating power over their working conditions and wages. With India’s allocated budget for school education falling every year, and the funding for teacher training down by 87% in the last six years, it’s no wonder that the country’s teachers are angry. Most recently, on the February 10, contract teachers clashed with police in Patiala, Punjab, while agitating “against the various arm-twisting tactics used by the state government to force the teachers to join at a monthly salary of Rs 15,300”. According to these teachers, the government has been withholding salaries until contract teachers accept their regularisation policy, which requires that SSA and RMSA teachers work for Rs 15,000 a month for three years until they can be regularised. Santosh Mehrotra, a professor of Economics at the Centre for Labour in Jawaharlal Nehru University, writes that the employment statistics are even worse than previously understood. Recently leaked NSSO data corroborated the idea that unemployment is still rising but the Chief Economic Adviser has tried to shift focus to “meaningful employment”. This attempt at changing the goalposts ignores another point. “What the recently leaked data also reveals is that as open unemployment rates increase, more and more people got disheartened, and fall out of the labour force. In other words, they stopped looking for work, even though they were in the working age”. The data shows the labour force participation rate falling steeply over the last ten years. The unemployment rate among the education is also rising. Like the agricultural crisis, this too seems like a challenge that the current government simply does not know how to solve. While the government is vociferously fighting the jobs data, the real crisis of Indian economy is not the crisis of data, nor the crisis of unemployment but the crisis in employment. Over 92% of the jobs remain in the informal sector. It means that almost all of India’s workforce is employed in occupations that are low paying, with appalling work conditions, and bereft of or hidden from labour regulations. NSSO, as well as ILO data, corroborate this feature. India’s labour market is as bad as those in Sub-Saharan Africa, even as the country prides itself over its economic size. In spite of government support to private enterprises to formalise and dilution of labour regulation the bulk of the jobs being created remain in the informal economy. The article argues that the state cannot remain in denial and it requires a multi-pronged approach including strengthening collective bargaining among informal workers to improve the quality of these jobs. Rajasthan is known for its rich handicrafts and also for its track record of child labour. With an estimate of over 2.5 lakh children in forced labour, it ranks first in India in the incidence of child labour. The primary cause is the booming handicrafts industry that requires intensive labour of dexterous hands that come cheap. The very industry that draws the large number of tourists to the state is also the reason for the trafficking of children from rest of India, especially Bihar. Many non profits and rights organisations have fought against this scourge for a long time, attempting innovative ways to disincentivise child labour. Their efforts have gained a shot in the arm, with the new state government, concerned about the deleterious perception caused by Child Labour on tourism, engaging vigorously in the fight to curb Child Labour. Here is a report from Reuters. Though India has 10 million working children, documented by ILO data as ‘main workers’ and ‘marginal workers’, the budget allocation to rehabilitate working children fell by 17% this year. The strike by the Uttar Pradesh government employees that began on February 6 was called off on February 8 after the Allahabad high court ruled against the strike and asked the administration to take stringent action against striking workers. As in many other states, the government employees were demanding the restoration of the old pension scheme that guaranteed benefits. Over 20 lakh workers had defied the state government that had invoked ESMA (Essential Services Maintenance Act) to threaten the workers. But with the court ruling against the workers the unions decided to call off the strike. Fifteen bonded workers from Odisha, including seven women, were rescued from a brick kiln in Peddapali, Telangana. The labour departments in both states are working together to get them back home. Over 1,400 sanitary workers employed by Tiruchi Municipal Corporation went on a protest this week to demand that the government disburse their wages on time. Their salaries have been delayed by over 10 days this month. Even in December, they had faced delays which cause major disruptions in the day-to-day lives of the workers. After France, Italy has been hit by a wave of protests. Hundreds of thousands of workers are on a march against populist governments that have failed to increase employment and real wages. Italy has the third highest level of unemployment in European Union at nearly 10%. Successive governments have not been able to resolve the issue and have resorted to increased pensions and guaranteed income for the poor to offset the costs of growing unemployment. But trade unions are demanding more structural reforms that will provide quality jobs rather than palliatives. Finnish experiment shows the limits of Universal Basic Income as a economic tool. The interest on Universal Basic Income as a policy tool is increasing across the globe. Indian political parties have promised one or the other form of UBI as a policy initiative for the future. In this context, a social experiment carried out in Finland for over two years might have very relevant inferences to draw. The study finds that while UBI did not have a significant effect on beneficiaries finding better jobs, it did decrease their stress and improve their overall state of mind. One of the major tropes in neoliberal economics is that labour regulations kills jobs and plays a detrimental role for the workers by reducing the demand for work. Indian policy makers, for over three decades, have justified the roll back of labour protections on this ‘logic’. However, even as the economy has made large strides in the ‘ease of doing business’, the nation is caught in an endemic of joblessness and falling real incomes. Yet, government bureaucracy, think tanks and opinion makers have found refugee in economic research which are based on wrong assumptions, methods and models. Here is an article that exposes the fallacies of one such popular research study on effects of labour regulation on job creation. Debunking this article along with a range of other articles that propagated this notion, the author leaves us with the lingering question of the cost of such faulty research on the working population. He calls for greater circumspection and humility among economists and caution among policy makers. Shameless plug: Thomas Manuel and Srividya Tadepalli, the co-authors of this newsletter, spoke to multiple social science PhD scholars about their thoughts on the recent protests (and partial win) by science PhD scholars for higher stipends. Read more here.